“When are you going to send us your new articles?” editors from Delhi to New York inquire, their voices filled with anticipation and urgency. Readers from Hamburg to Pretoria browse the papers they just purchased at the newsstand, looking for an essay with my name in the byline. The astronauts on the International Space Station disappointedly turn towards the rest of the internet after there hasn’t been anything new on my blog for a few days. In reality nobody asks, except some of my parents when they notice that it has been another six months since they last had an update from me. Everyone else has come to accept that I am either lazy or that I simply disappeared. You see, I love to write and I write a lot. The second, third and fourth steps – writing a fair copy, editing and publishing – are the weak points. One reason is that there is constantly new stuff happening. New countries, new wars, new stories. 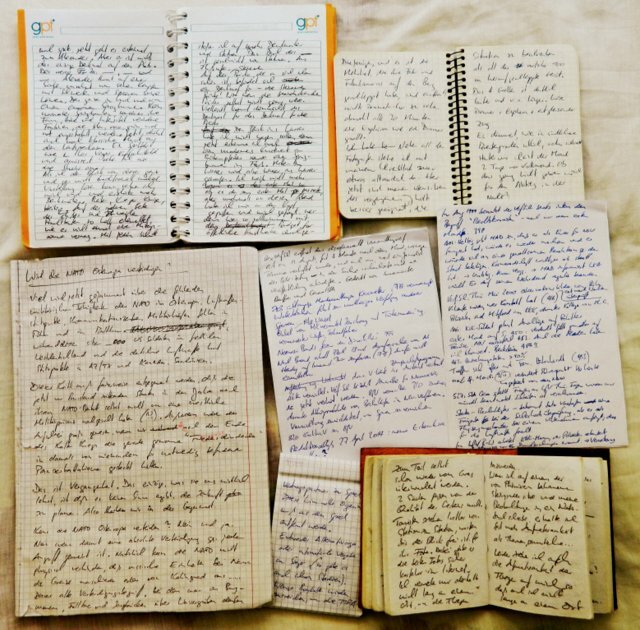 And even when nothing new is happening, I have new thoughts and ideas every day, one notebook being filled after the other – and gathering dust. I need a break. Three months without travelling, without new impressions, without adventures. Time to think and write. During my time in Bari I also noticed how important location is for writing. I live in a shared flat in the center of a loud city with loud people. When I open the window, I hear crackling and honking cars, scooters and ambulances, as well as people who are shouting at each other. Many of them are even loudly speaking to themselves, holding a little gadget to their ear (a prompter?). And dogs! Why can’t anyone shoot these mutts? When I close the window, I hear the tasteless music of my flatmates, the banging of doors and phone calls in Polish, French or Spanish. I find neither a quiet corner, nor some quiet hours. Some people pretend that they are able to work even while it roars and rumbles around them like on a bus full of schoolchildren. I can’t. I need quiet, I need to be alone, ideally for a longer period of time, not only one hour in the early morning and two hours during the extra-long Italian siesta. I need to find a quieter place next. An apartment to myself. My dream would be a small house or a cozy prefabricated apartment block in a mid-sized town in Eastern Europe, where after jogging in the park I would sit in my writer’s chair, sip a hot chocolate and admire how snowflakes can prettify even communist architectural eyesores. A perfect setting for writing! On 1 October I will move. I am still looking for a new place. If you have something that doesn’t cost much more than 200 € in rent per month, please let me know. Thank you! This entry was posted in Apulia, Italy, Life, Travel and tagged Bari, blogging, writing. Bookmark the permalink. You have been to Malta so you know what the deal is. However, when you were moving here, some suggested to visit Gozo. Did you ? If you can handle re-visiting an already encountered country, you should check out Gozo in winter. It’s dead. Dead in a good sense. You will have plenty of time to think, write, and relax. If you can handle a long let (long is 6 months minimum) you might find a deal close to your budget. I don’t have contacts but I am sure that you will be able to find a couple of places just by searching on internet. Working prospects in Gozo might, however, be somewhat of a problem. Working prospects are no problem luckily, because I almost never work locally. I have my freelance clients scattered around the world. Yes, I did visit Gozo and I found it very tranquil in a good sense indeed. But unfortunately I have this silly rule of not living in the same country twice, in order to allow me to get to know new places and to push me out of my own comfort zone. I did suspect you wouldn’t return in fact :) The world is big, you will find someplace nice I am sure! he has to come back. he left a couple of pregnant girls in Paceville! Your lawyers will hear from my lawyers soon. Virginia says that every writer needs 500 pounds a year and a room of her own. If one is not born into privilege then one needs to find a papi chulo or a mani chula, I mean, patronage. By living in relatively cheap places, I can actually manage to survive for around three months with one month’s work, so I get by without any patronage. But I found that a room of my own is not enough. As long as I know that there are other people in the apartment or the house, or that somebody else might come home any minute, I can’t get into the proper mood for writing. Even regular visits by the Jesus Witnesses are a disturbance. I’ll include them in one of my stories for punishment. 500 pounds a year is also not nearly enough :) A Room of One’s Own is a concept. One needs not to have mundane interferences such worries about living expenses and to have a place of one’s own to develop one’s craft as a writer. But adjusted for inflation, I get by very well with less than 500  pounds, and I am even paying accommodation out of that. That lady sounds rather spoilt. She was. I think she committed suicide by walking into a river with her £10,000 coat. Adjust that for inflation. I would go to Budapest for Eastern European charm or communist eyesore sculptures. Ljubljana probably has the most amazingly beautiful people. Actually I would say that is probably true for most former Yugoslovian. For the world’s most unexpectedly kindhearted people, I would go to Bratislava. For the greatest testament to the triumph of the human spirit to live and coexist with neighbors, I would go to Sarajevo. For the best cup of hot chocolate, I would goto Krakow. For the coolest walk across a frozen river, I would goto Latvia. I would advise against spending a penny in Austria, people there are just weird and mean on average. After all it was the country that produced Hitler. I have to say though, they do know how to make a mean schnitzel. You could probably do well to avoid the Czech Republic, Slovokia is most def better off without the Czech republic. It’s on the other side of Europe, but I think Portugal is pretty neato and still very affordable. I judge them on how they treat tourists. There was once I missed my stop on a bus in Austria. I got off the bus as soon as I realized but had not idea where I was. So I whipped out a map, approached a middle aged couple at the bus stop, and politely explained that I was lost and if they would mind so kindly point out on the map where I was. I said all this in my ueber cute American accent auf Deutsch, mind you! The guy went totally ballistic and started yelling at me, a total stranger, are you stupid? You just got off the bus and you don’t know where you are?……. Wow. Let’s just say that I probably have been to a few dozen countries across 4 continents and this has never ever happened before. Dirty looks? Maybe. Feigned ignorance? Maybe. Never had I ever had someone going postal on me for asking for directions. ca. 200 Euro? ich habe eine Couch, KOSTENLOS. kein Problem. Das ist super-nett, vielen Dank! Aber da ich jetzt ein halbes Jahr in einer WG gewohnt habe, suche ich jetzt eben wieder eine Wohnung für mich allein, um die zum Schreiben notwendige Ruhe zu haben. But it is so nice here…Neustadt an der Weinstrasse. wir können auf Pälzisch reden. a jo, saachemool! what a horrible handwriting! i told you several times. NEVER write during an earthquake or while you’re ******* off! I have to write so fast to try to keep up with my thoughts. would a voice recorder help? Marseille is beautiful, and in particular the Calanques. I spent two weeks with the scouts there one, fighting forest fires, but also sailing, diving, climbing and hiking. But I doubt I could find an apartment within my price range there. Some people actually can work while surrounded by people moving and being noisy. I don’t understand that, just like I don’t understand e.g. the concept of “thinking out loud.” But I’m getting used to the thought there’s stuff I won’t ever be able to understand. I can do that only with very routine work, like standard e-mails, updating databases, maybe translating very simple texts.